One of the most common misconceptions among addicts and their families is the notion that doing something over and over will somehow yield different results. Alcoholics, for example, think that if they just drink on weekends, if they drink beer instead of hard liquor, or if they drink only at home, they somehow will not get drunk. They convince themselves that given different circumstances, the same behavior will have different outcomes. This is their denial. The same is true for families of addicts. They believe that if they just say, “You have to stop!” enough times in enough ways that eventually they will be heard. They believe if they just give one more chance one more time to the person they love who is taking advantage of them, the agony and chaos of addiction will stop. This is their denial. A recurring thread in relationships affected by alcoholism and drug addiction is this mistaken attitude. Popular rap star Macklemore, who discusses his drug relapse in an article for Celebrity News, admits that he rationalized his behavior with this type of thinking pattern. He convinced himself he would quit using the next day, and the next, and the next. It took a serious wake-up call for him to break through his denial. A frequently heard response in recovery is, “Nothing changes if nothing changes.” Once alcoholics, addicts and their families accept the need to think and act differently, they will be ready to start on the pathway to a new life. Change can be a frightening thing. It means letting go of what is familiar, even if what is familiar is destructive. 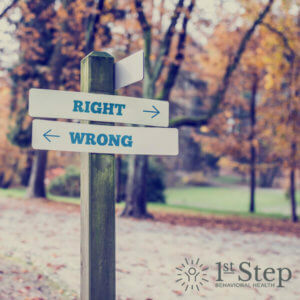 Making the decision to enter a professional treatment program is a major step in new behavior. When a medical team, therapists and counselors work with individuals in rehab, they help them determine the best possible road to recovery. By working together to alter the direction of old thinking patterns and to let go of old habits, they create the framework for a life in sobriety.